We’ve been getting great daikon at the market. 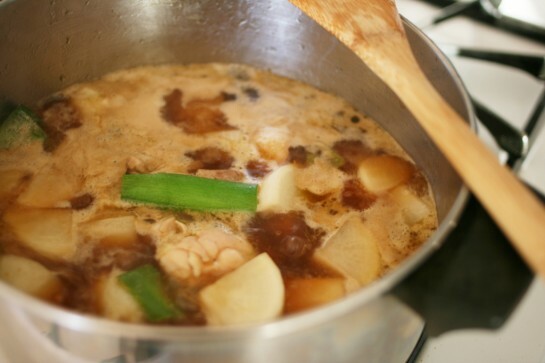 I wanted a recipe with a well-seasoned broth that gently cooked its flavors into the daikon. I found this Chinese-inspired dish in haru-mi, Harumi Kurihara’s quarterly magazine. The savory broth is made from the reserved liquid from rehydrated shiitake, chicken broth, shoyu, oyster sauce, leek, and smashed fresh ginger. Then, it’s finished off with a drizzle of sesame oil. This is easily one of my favorite daikon recipes. In general, I’m not a big fan of dried shiitake unless it’s sliced thin and used sparingly, like in sushi or this recipe. So, while it imparts a great flavor to the broth, I don’t like to chomp down on this spongy, intense mushroom. Maybe using a combination of fresh and dried shiitake will make it more palatable. An experiment for next time. By the way, I got a new cutting board and love it! I was in the market for one and noticed a Japanese hinoki cutting board at Sur La Table for over $100. I wasn’t ready to fork over that much, so you can imagine my excitement when I spotted a similar board at San Francisco’s new Muji for around $30. I love it because it’s incredibly light, the soft wood won’t dull your knife blade as quickly, and it smells wonderful. Slowly rehydrate the shiitake in a bowl with 2 cups of water (about an hour). 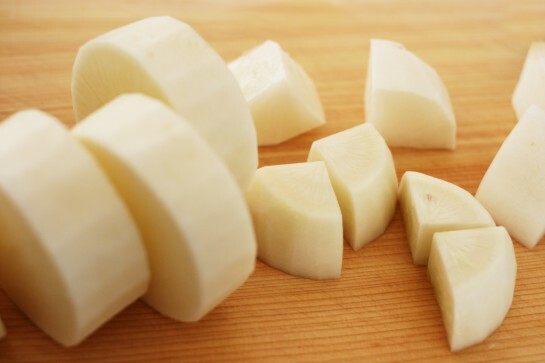 In the meantime, cut the daikon crosswise in 1.5 inch sections. Then, slice each disk into quarters. Let the chicken sit in a medium bowl with the marinade ingredients. Squeeze the liquid from the shiitake and slice in half on the diagonal. Reserve the soaking liquid. 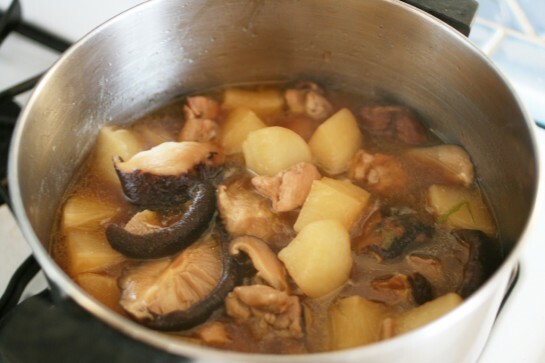 Combine the reserved liquid, chicken broth, Shaoxing wine, shoyu, oyster sauce, and sugar in a mixing bowl. In a separate small bowl, mix the katakuriko with 1 Tbps water and set aside. 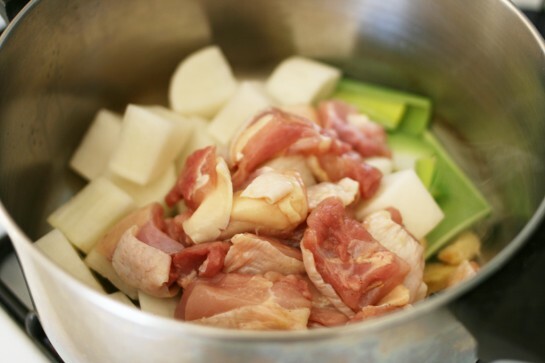 Heat the oil over medium-high in a large pot, then add the ginger, leek, daikon, and chicken. Cook for 7–8 mins, stirring occasionally and making sure the chicken is no longer pink. Add the broth mixture and bring to a boil. Skim off impurities. Add the shiitake and place an otoshibuta on top (I don’t have one that’s big enough, so I used aluminum foil—pictured above). 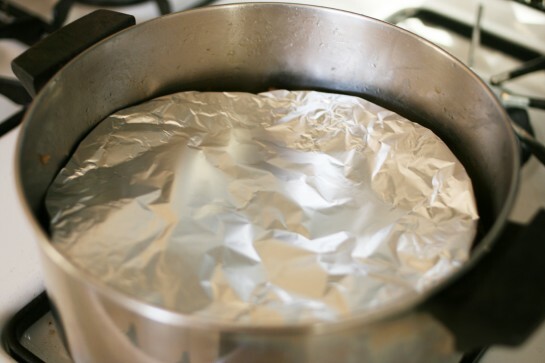 Lower the heat and simmer for 25–30 mins. Give the katakuriko and water a good stir, then pour into the pot ingredients. Mix well to incorporate and thicken the sauce. Lastly, drizzle the sesame oil. 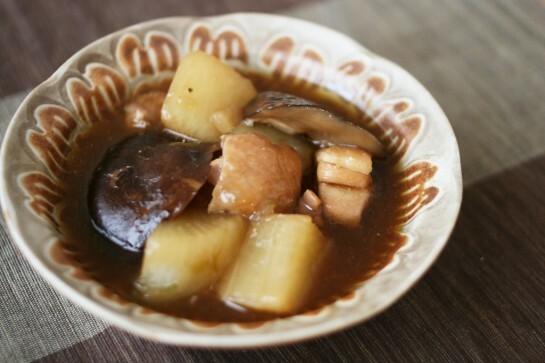 This entry was posted in Contemporary Recipes, Favorites, Meat and tagged braise, chicken, daikon, ginger, katakuriko, leek, oyster sauce, potato starch, sesame oil, shiitake, shoyu, soy sauce. Bookmark the permalink. Post a comment or leave a trackback: Trackback URL. Muji… I wish I had it in my city (or country!). The board looks perfect. This looks pretty perfect for the blustery cold whipping through New York right now. Putting aside your objections to the sponginess of dried shiitake, I’m intrigued by this recipe’s treatment of textural contrasts (silky daikon and leek vs. chewy mushrooms and chicken). Sissi, just wanted to let you know this isn’t really a soup—more of like a side dish, like nishime. The broth is probably too salty to sip! Emma, you’ll have to let me know what you think of the shiitake. The ones I used were particularly meaty, so I had a hard time eating them! OMG i loooooove daikon, and reading this recipe is making my mouth water! can’t wait to try it – thank you!!!! Thank you so much, Azusa. It looks like a delicious stew/thick soup though :-) I will keep your advice in mind. Made it last night but used a blend of usukuchi and standard shoyu. Daikon really is a perfect winter vegetable. My dad used to make chinese stewed beef with daikon/carrot and five-spice but it’s so heavy. 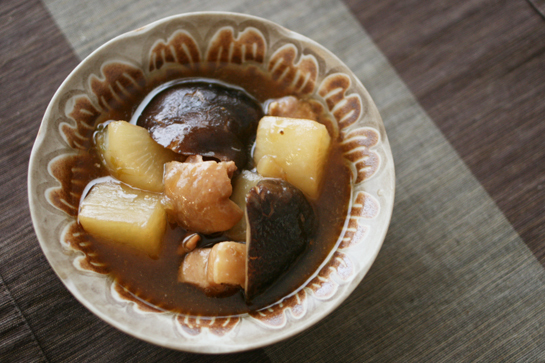 My mother who is japanese used to make chilled stewed daikon. This recipe is so wonderful and doesn’t overpower the mild daikon so thanks for posting! Actually, I like reconstituted shiitake (I let mine soak for an hour but it’s better overnight). My boyfriend prefers fresh shiitake so next time a combination instead. The broth from the dried shiitake makes a difference and I do think that it’s absolutely necessary. karen c., thanks for letting me know how things worked out for you. I agree with you about the dried shiitake—the flavor is great. I think the half and half mixture of dried and fresh shiitake will be a good compromise. I’m happy you liked the dish!